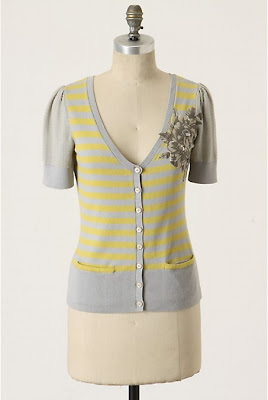 I don't love the sweater itself all that much, but the flowers on the side are just a piece of cotton hand-sewn invisibly down--I like that idea! Easy and pretty. So, I tried it myself--here's the tutorial! Take a plain sweater, preferably cotton, that needs a little something extra to make it interesting! This is an old one from Target. Carefully, with sharp, sharp small scissors, cut around the design you're going to use leaving 1/4"-1/2" extra fabric that we'll turn under. If the design is simple, with few bends and curves, I'd use closer to 1/2" than I did. Add little clips toward the design on all of the curved edges, so you don't get wrinkling when you turn under. Carefully press under the fabric 1/4"-1/2", whichever you used when cutting. You may have to add some clips on the curves and the indents to make it lay flat. Position and pin the design on your sweater where you think you'll want it. I didn't get too creative; I just stuck it where the Anthro sweater had a design, but you could use this technique on the hip of the sweater, or on the shoulder... wherever! Carefully whipstitch the design down, making sure to keep all sides of the design flat so it doesn't pucker when it's done. I caught about three threads of the appliqué with each stitch, so my sewing just barely shows on the top. Great to pair with a summery skirt and top for going into air-conditioned buildings! Love it. Now to find a sweater in need of some love. So sweet and girly! LOVE IT! PLEASE, PLEASE come to Toronto, ON, Canada, and offer up a course or workshops. I'll be your student from start to finish. What a prefect little sweater! so cute and summery. So pretty - I found you through One Pretty Thing and have looked at a few of your creations before but... I am now a follower and since I have just bought my very own sewing machine (instead of ducking over to Mum's house everytime I wanted to sew), I will be taking inspiration from your creations. And PS, I just spent my whole work day reading every single one of your posts... Love it hard! Great!!! I just noticed that Target has a bunch of cropped sweaters on clearance. I might have to go back and grab one. They are short sleeved and great for our California nights that can be a bit nippy even in summer. Love it! I love the color of the cardigan too. You always come up with great stuff.